SmartMovie 4.15 is a video player designed specifically for mobile phones with a tool for processing video files in different video formats in the running on mobile phones. SmartMovie Player has reached version 4.15, is a video player that comes with two integrated functions: the captioning and the conversion of files from one format to others, specific mobile phone. So all you have to do is to convert video files from your PC into a video file that can be run on the phone to upload the converted file in phone memory or SD card, then turn and watch the video through your player SmartMovie already installed in your phone. How to use SmartMovie Player 4.15? 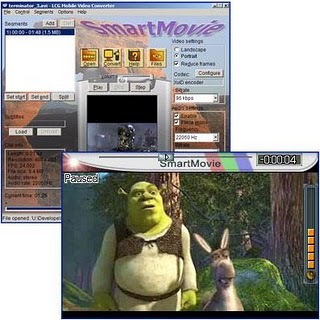 - Use SmartMovie Player to run videos. - custom brightness and volume adjustements for SmartMovie Player. Nokia: E5-00, E50, E51, E52, E55, E6, E60, E61, E62, E63, E65, E66, E7, E70, E71, E72, E73, E75, E90, N71, N73, N75, N76, N77, N78, N79, N8, N80, N81, N82, N85, N86, N91, N92, N93, N95, N96, N97, 3250, 5228, 5230, 5235, 5250, 5320, 5500, 5530, 5630, 5700, 5730, 5800, 6110, 6120, 6124, 6210, 6220, 6290, 6650, 6710, 6720, 6730, 6760, 6788, 6790, X5, X6, X7, C3, C5, C6, C7, any Windows Mobile 5, Windows Mobile 6, Windows Mobile 6.5, Windows Mobile 8, Android 4.0 Ice Cream Sandwich, Android 4.1 Jelly Bean device. This software is marked as Shareware and for full version you need to buy a license! Download SmartMovie Player 4.15 for Symbian!